Live for now, will link the record later. The NSF representative bobbled some of her statements, but largely got things right. Halzen has a good sense of humor and of proportion--I like him. Some of the animations the presenters used make things much clearer. This has been in the works for months, as people tried to make sure all the eyes were dotted and teas crossed. Executive summary: For the first time we were able to tell where an extra-solar neutrino came from, and it pointed back to a flaring blazar. (That tells us something about blazars, too.) 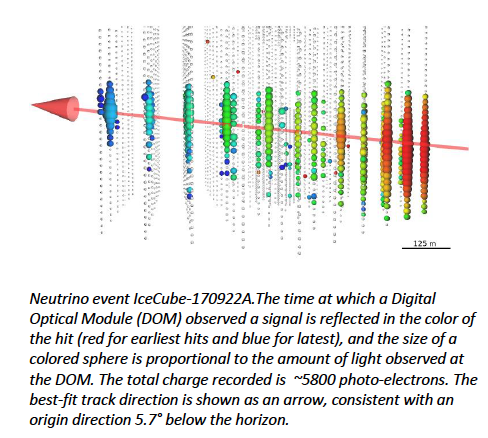 IceCube saw a neutrino, told the rest of the world, and fast telescopes looked to see if they could see it too. Fermi and Magic did, and said it was associated with a blazar that flares now and then, and was flaring right now. IceCube went back to the last time it flared and looked for an excess of energetic neutrinos coming from that region, and found them. The old excess wasn't something to write home about by itself, anymore than seeing plants chewed down inside your garden fence tells you there's a deer. But if your neighbor says there's a deer around, and you see a deer track in the front yard, the chewed-down plants mean something. Since only about 1 in a hundred thousand neutrinos at that energy will interact in IceCube, that means there were an awful lot of neutrinos coming from that blazar. We can tell from what direction gamma rays come, but most of the cosmic rays that hit us are nuclei, and charged. The magnetic fields of galaxies are weak but gigantic, and bend the cosmic rays this way and that. A proton from SagA* might wind up hitting the Earth from the opposite direction. Gamma and X rays can come from two different sorts of processes--one which involves nuclei interacting with things and one which is pretty much entirely electron-in-magnetic-field-based. Neutrinos come almost entirely from the first class of processes, as nuclei interact with stuff (e.g. other nuclei or the background light around the galaxy) to produce pions that decay to neutrinos. Blazars (actually, any active galaxy--blazars are just active galaxies whose jets point at us) can produce the cosmic rays we've been trying to understand the origin of for a long time. I haven't seen estimates for the numbers yet--they'll be pretty rough because we haven't seen very many neutrinos yet--but maybe we can get some idea of what fraction of cosmic rays come from active galaxies. You seem excited, but I admit I don't get the significance. Is it that we have evidence of extra-solar influence, however small? 3) Blazars (actually, any active galaxy--blazars are just active galaxies whose jets point at us) can produce the cosmic rays we've been trying to understand the origin of for a long time.